The new Samsung Galaxy Skin is set to feature a bendable AMOLED display that will allow users to roll it up like a wrist-watch. 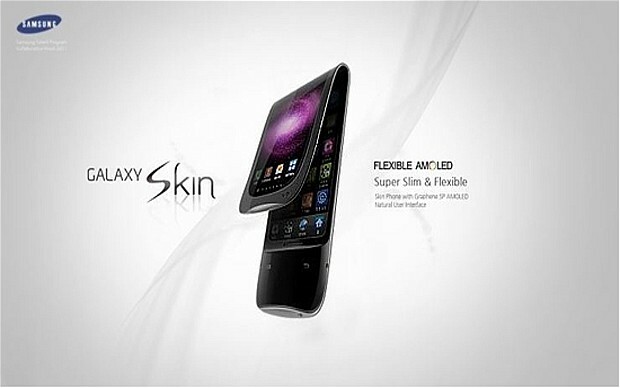 Samsung is poised to release a flexible mobile phone, according to reports in the International Business Times. The new Samsung Galaxy Skin will feature an AMOLED display that will allow the phone to bend around a cylinder with a 1-inch diameter. Brighter than the normal screen, the AMOLED display is also low-energy and almost unbreakable, according to the reports. Using a plastic polyimide substrate instead of glass, Samsung has produced displays that are “rollable [and] bendable” and which can even “survive blows from a hammer”. The phone was developed by Prof Haeseong Jee and Jye Yeon You. The key material of this new technology is ‘graphene’, touted as “the miracle material”. Research by scientists from Columbia University has established that ‘graphene’ is the strongest material in the world, “some 200 times stronger than structural steel”. The Galaxy Skin will offer a high-resolution 800×480 flexible AMOLED screen, eight megapixel camera and 1Gb of RAM as well as a 1.2GHz processor. Samsung has not yet disclosed the device’s operating system, but there have been rumors about Jelly Bean – Google’s next Android release after Ice Cream Sandwich – or a new release called Android Flexy. The new core technology also allows the phone to be used as a mouse, a clock or a wrist-watch.